A young couple's pleasing sense of style creates modern farmhouse vibes. A version of this article originally appeared in the Fall 2018 issue of OUR HOMES London and Middlesex County, p.20. Find local businesses in our London directory. 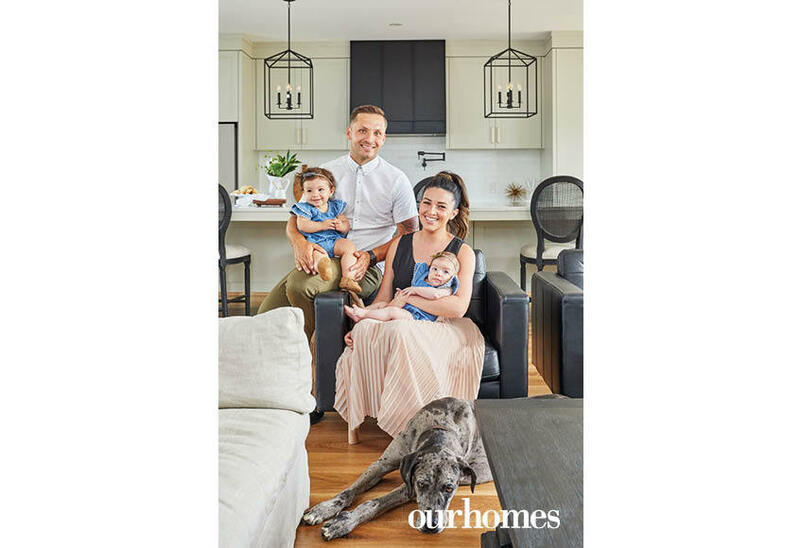 Luke and Patricia Oslizlo have made a life and a living designing, renovating and flipping houses. 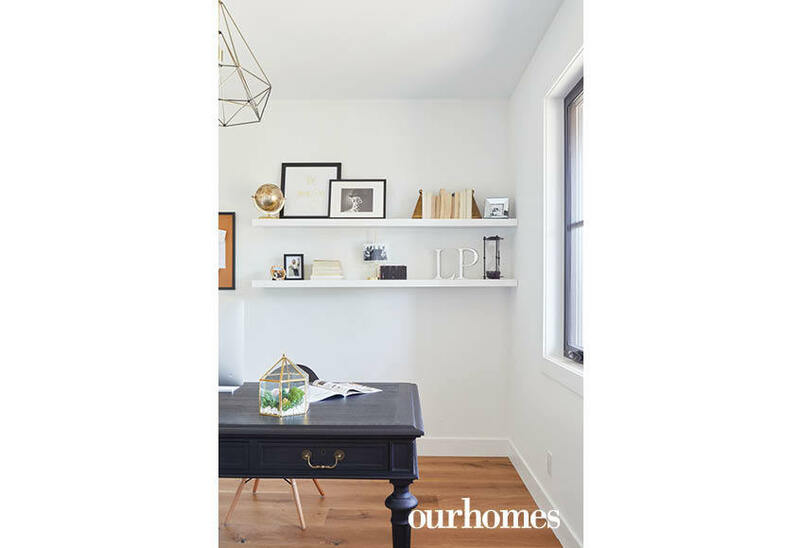 The husband and wife team founded Details Renovation & Design in 2013 when their shared passion for design evolved into a full-time business. This fall they will become Tarion-licensed builders and will begin building custom homes for others. The result is a stunning 4,400 sq. ft. modern farmhouse. 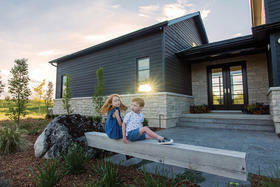 With its white Hardie Board exterior and black front door and window frames, the home is a standout along the rural road. “Everyone thought it would be too much white, but we broke it up by using cedar shake on the dormers,” Luke notes. A large, open great room was a must. 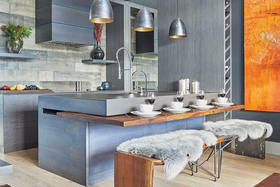 The kitchen, designed, built and installed by The Wood Studio, features shaker cabinetry reaching to the ceiling. 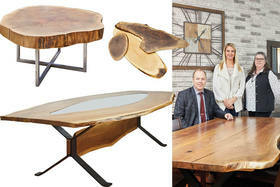 The enormous centre island was built to look like a piece of furniture. 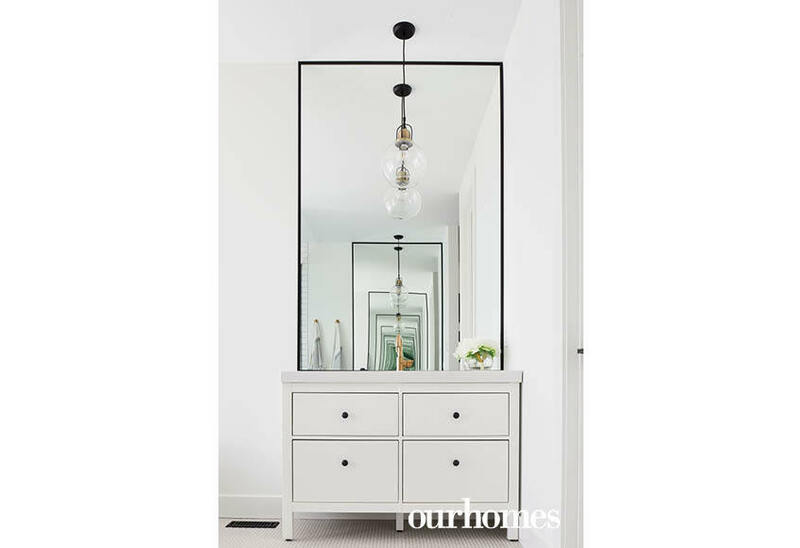 It features pull-out drawers and a grey-veined Marrara quartz countertop from Sloan Stone Design Quartz & Granite, and is a popular gathering spot for family and friends. 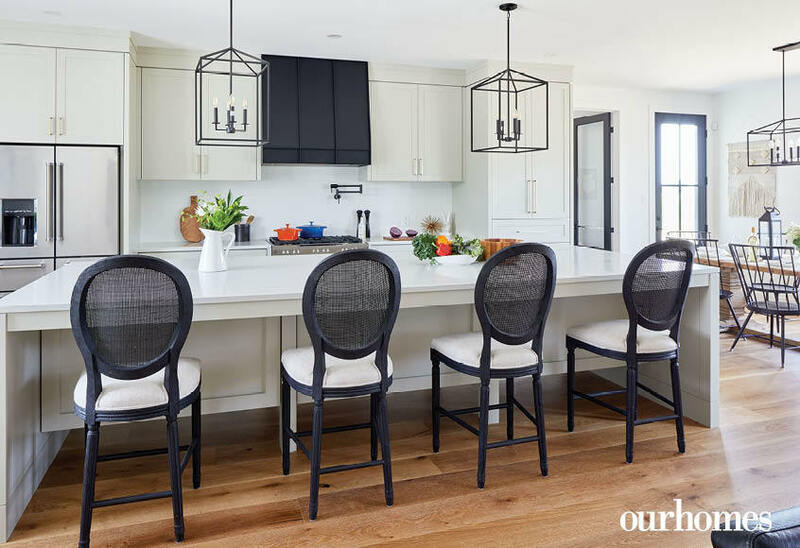 Black window frames and black doors used throughout the house provide a striking contrast to the walls, which are painted Benjamin Moore Chantilly Lace. The serene master retreat is painted Benjamin Moore Dove Wing and boasts a shiplap feature wall as well as long, white drapes. The couple’s love of black trim continues in the master en suite. 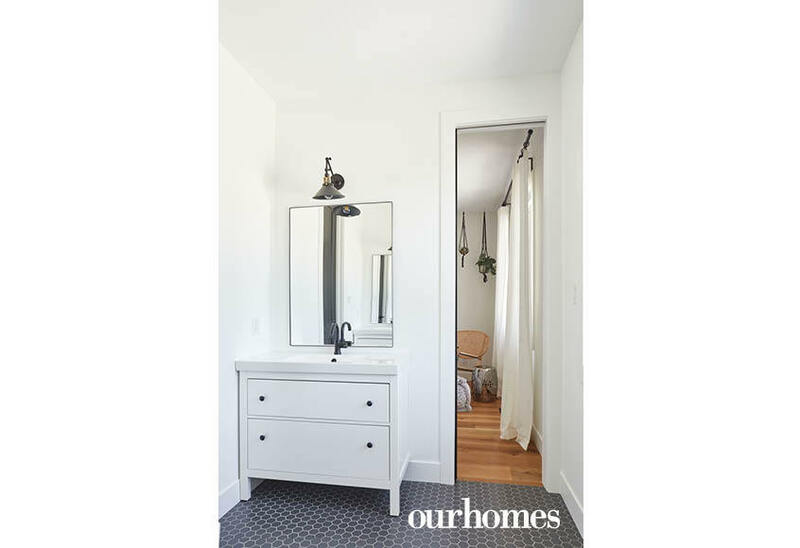 Custom mirrors, bronze-finish faucets and fixtures from The Ensuite, a large walk-in shower freestanding bathtub and penny tile flooring create a contemporary oasis that respects the farmhouse aesthetic. 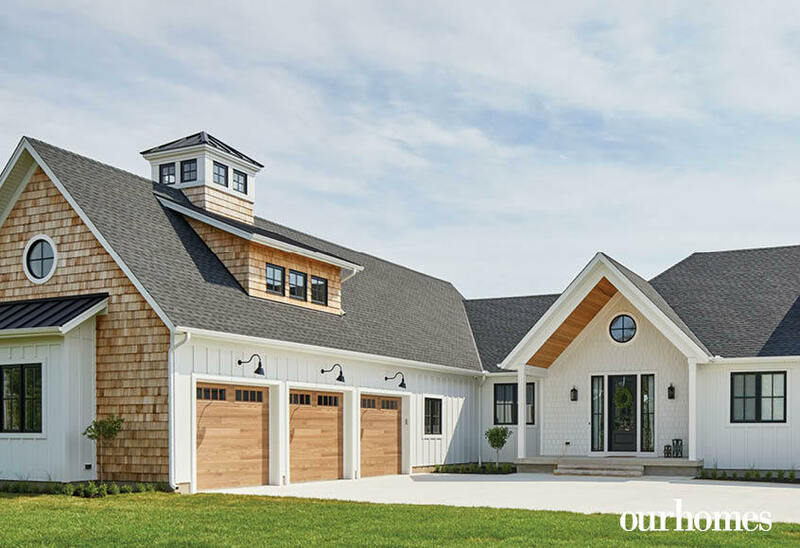 Cedar shake and white wood siding plus clean exterior lines and contemporary black windows add up to a country property with modern flair. 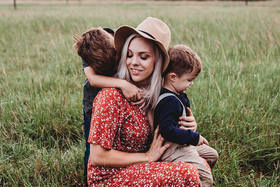 Designing duo Luke and Patricia Oslizlo with Scarlett, Lennon and family pooch Frannie. A vaulted beamed ceiling adds drama and complements the interplay of warm wood accents and floors with crisp black and white detailing in the living room. Engineered oak flooring is used throughout, adding warmth to the space. The home’s spacious dining area opens casually to the living room, as well as a screened porch. 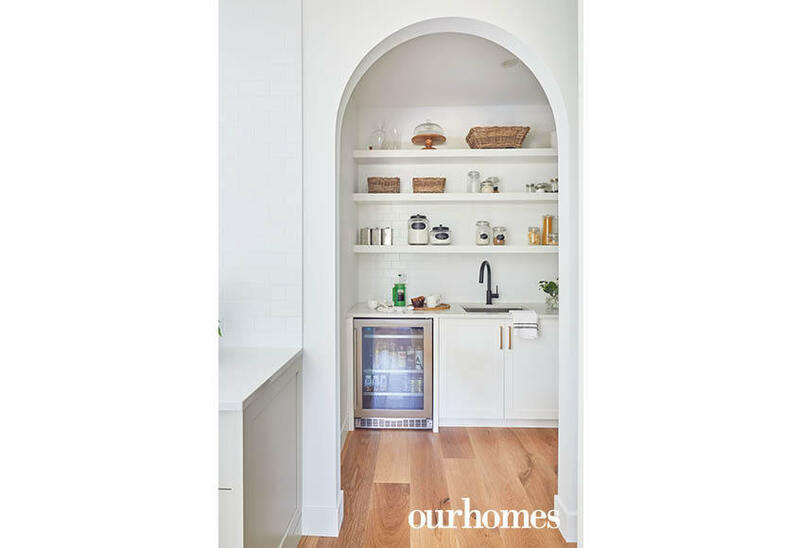 A well-stocked pantry just off the kitchen keeps clutter at bay and offers another prep zone. The master bedroom’s shiplap walls add a cottagey vibe. The spa-inspired master bathroom provides a relaxing retreat for two busy parents. The master en suite is accented with bronze-finish Delta Trinsic faucets and fixtures from The Ensuite. 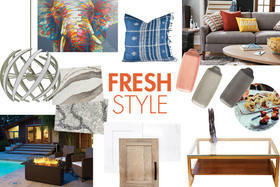 Even the play zone in the airy home’s lower level reflects the couple’s carefully curated personal style. Two children’s rooms are joined by a Jack-and-Jill bathroom with hexagon tile flooring from Olympia Tile & Stone. 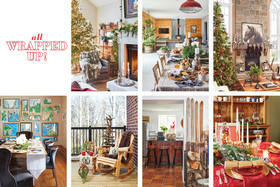 The girls’ nurseries continue the clean, uncluttered look of the home. 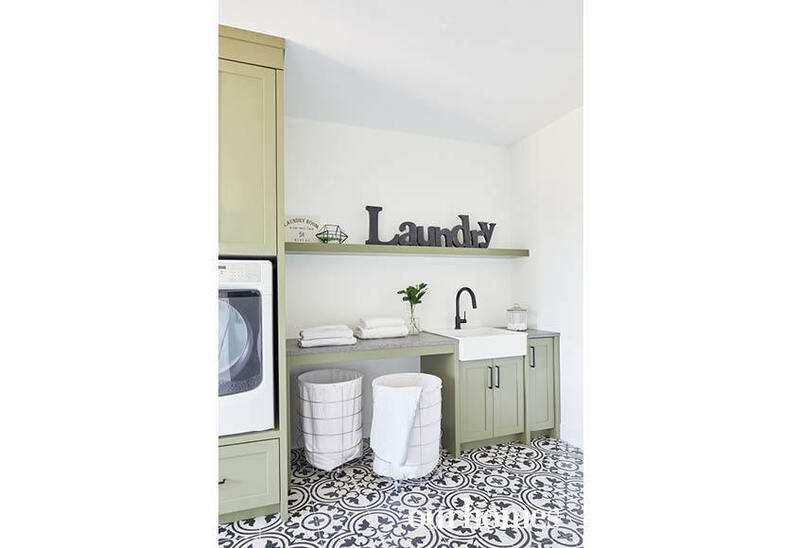 Stylish storage cabinets (The Wood Studio) combine with a Rugged Concrete quartz countertop (Sloan Stone Design) and black and white floors in the spacious laundry room. 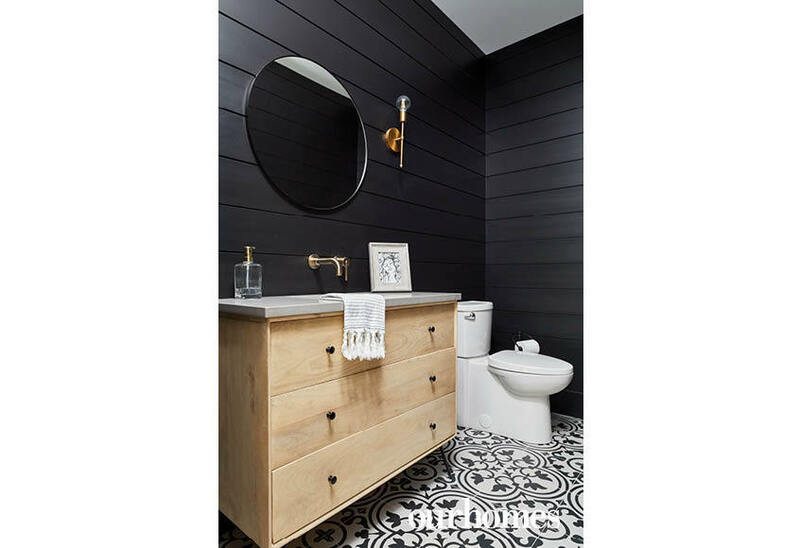 Black shiplap teams up with black and white geometric floor tiling for a bold statement in the powder room. The Details Renovation & Design home office overlooks the property’s rural landscape.